Now that spring is here, we can start to get ready for the summer months and we are making plans for the Hill. Some of the taller bushes and trees were removed on North Heath. This was at the Two-Bench View Point on Windmill Ridge and the aim was to increase the range of view here, particularly towards Wales. On the opposite side, looking towards Liverpool, clearing of Birch and Gorse took place and it was decided to create a cleared strip called “The Ribbon.” The ‘strip’ some 15 to 20-foot-wide from the Ridge and reaching as far as Taylors Wood, would improve the sightline and also act as a fire-break. Within this area, the wetland parts are being improved for wildlife and habitats for creatures made by piling up cut-down material. Further progress in cutting “The Ribbon” continues. The cutting down of a large patch of Gorse near the Windmill has opened up a pleasant area not accessible previously. In the wild plant meadow, more Teasel wild flowers were planted and we have an ongoing plan to develop this area. Looking a little bit further ahead to Spring and Summer, the Friends of Bidston Hill have purchased a Bat Detector. It will be used for research and training initially but perhaps bat walks could be organised later in the Summer and early Autumn, watch this space! For a full report of the Friday Group’s activities during this period click on ‘Volunteer Wardens Reports’. British Spring Clean – On Friday, 29th March, we will be having our Spring Clean Event (weather permitting) in support of the Great British Spring Clean. If you have some time to spare and would like to help with litter picking all are welcome. You can pick-up your litter picker at Tam O’Shanter Urban Farm, together with a suitable refuse sack. Please wear warm clothing and a good pair of boots. We meet at 10am at the farm and hope you can make it. Bidston Windmill – will be open to the public from 10 to 12 on the first Saturday of each month from April to September inclusive. 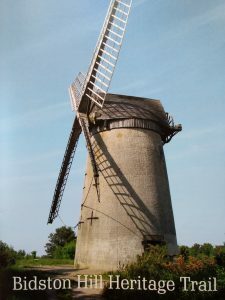 It will also be open for National Mills Weekend on SUNDAY May 12 from 10 to 12, and, same times for Wirral Heritage open Days on September 14. Last entry is at 11:45. There is a minimum height restriction for access to the higher floors (1.06m). Children under 11 years old must be accompanied by an adult at all times. Admission is free, but donations to the Friends of Bidston Hill are welcome. The Windmill is closed during the winter, when hibernating bats are in residence. Bidston Lighthouse – will open to the public on the first Saturday of each month from April to September from 12 noon until 4pm, so you can visit the Windmill in the morning and the Lighthouse in the afternoon. The Lighthouse will also open most Sunday afternoons from 7th April until Sunday 8th September. Please see the Bidston Lighthouse website before planning your visit. Bidston Observatory – Renovations at the Observatory are now almost complete. Please visit our temporary website www.bidstonobservatory.org for more information on what we are up to at the moment. There is an email address there if you would like to get in touch. We plan, in the near future, to arrange more tours of the building, as that seems to be very popular but we need to find and train up a few more volunteers as we are a very small team here. We will again be participating in the Wirral Heritage Open Days in September. Free guided walks of Bidston Hill – Every Saturday from 11 am. Come along and enjoy the wonderful historic woodlands and monuments of Bidston Hill and Flaybrick Memorial Gardens. Walks are supported by the Friends of Bidston Hill, Friends of Flaybrick Memorial Gardens, and Tam O’Shanter Urban Farm. Over 16s only. No dogs. Please wear sensible footwear (may be muddy or slippery). No sandals please! Download poster. Ron Williams – In memory of our dear friend Ron Williams who sadly passed away last June, we have placed a commemorative plaque on a bench at Windmill Ridge looking towards the Welsh hills. 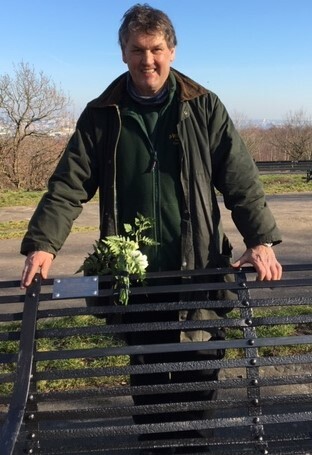 For many years, Ron played a big part in helping keep Bidston Hill and Flaybrick Cemetery suitably maintained for the local community, along with all other volunteers. In addition, every Saturday morning he would head a guided walk through Flaybrick and across Bidston Hill and was very popular with participants, some of which would regularly return time and again. From my knowledge, Ron was involved with other local volunteer groups offering his services because he enjoyed this so much. 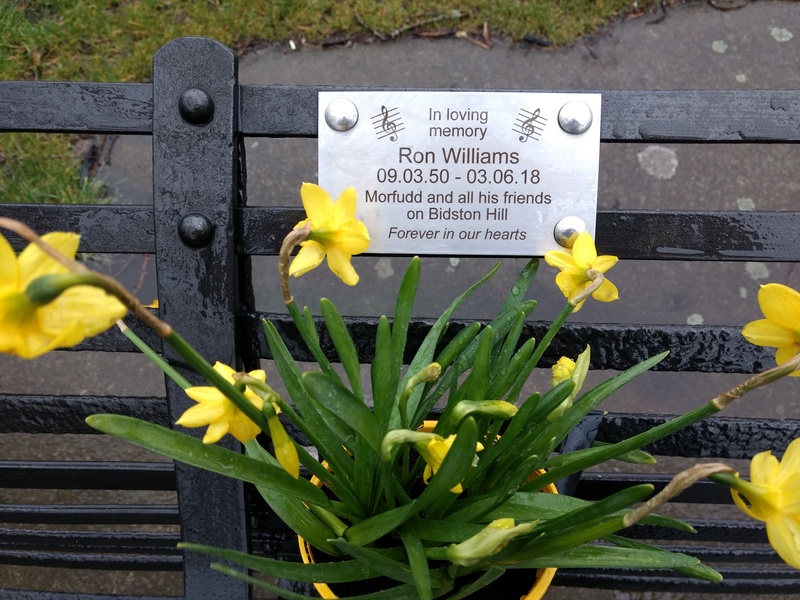 He was also the piano/keyboard player with the Northern Rhythm Swing Band, playing at local venues including Heswall Hall and Gladstone Theatre. In addition, he was a member of the Wirral Community Choir. Ron took pride in everything he did and showed a passion for getting involved locally and he will be greatly missed. 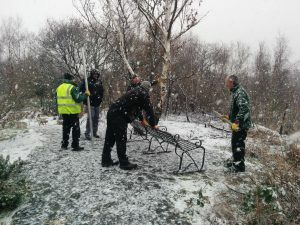 Below is a photo of our hard-working volunteers placing some refurbished benches on the hill in January, they never let the weather get in the way of maintenance projects! We would like to welcome the appointment of our new Ranger Neil Mutch, who has already proved to be a very good influence and contributor to the good work done by our Friday Group each week. Highlight on the Heritage Trail – Whilst some people will be aware of our Heritage Trail, from conversations during our popular Windmill openings and other events, it would seem that quite a number of visitors to the area are not or, those that are, have not, for one reason or another, completed the trail. 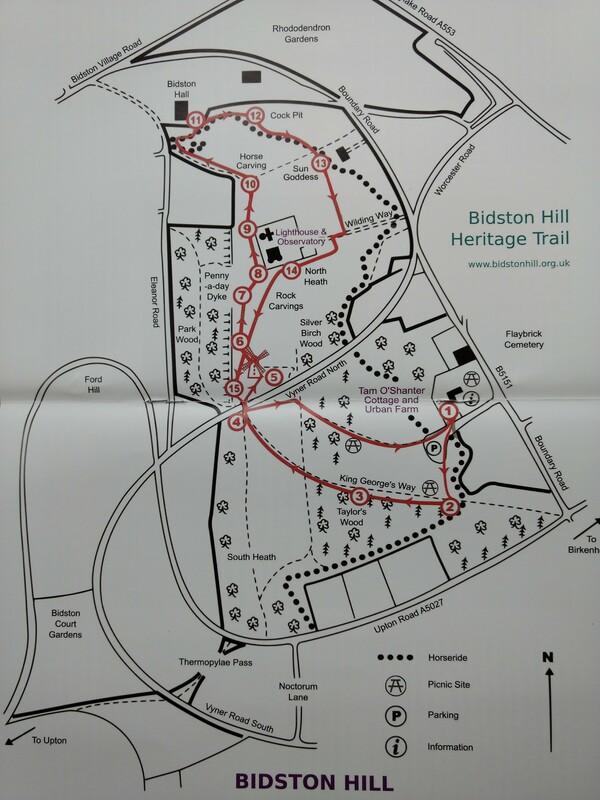 The Heritage Trail has been put together to allow people to explore Bidston Hill and its heritage for themselves. Follow the trail using the map and the numbered marker posts. Look out for the blue Heritage Trail markers, and the black and white QR code plaques. If you have a smartphone, you can use a QR reader app to bring up the matching Heritage Trail web page in your browser. A printed booklet about the Bidston Hill Heritage Trail is available from the Ranger’s office at Tam O’Shanter Urban Farm. For smartphone users, we also have a Geotourist version of the Bidston Hill Heritage Trail, complete with audio. If you have not experienced the thrill of going back in time to see such things as the Mummers’ Carvings or Sun Goddess and Moon God, amongst others, then you are in for a treat and we would urge you seek out these wonderful historic gems that lie on your doorstep! Even if you have blazed the trail before, it is always worth another look! Volunteers – We are looking for volunteers to join our Friends Group to help with the maintenance of Bidston Hill. If you have some time to spare on a Friday morning between 10 and 12 at the Tam O’Shanter Café and you would be most welcome to join us. There is no commitment to attend every week, as volunteers are free to come and go as they please. We are a friendly lot and the work we do is very rewarding. If you would like further information before taking the plunge just call John on 07887 665120 and he will tell you all you need to know. Please wear sensible clothing and footwear. AGM – This will take place on Wednesday, 29th May at 7pm. This year the owners of the Observatory have kindly advised they will be pleased to host the meeting in this iconic building. All are welcome and this could provide a good opportunity to gather an insight into the proposed plans for the future use of this Grade II listed building. Membership – If you would like to become a member of the Friends of Bidston Hill we would be delighted to welcome you aboard! There is a very low joining fee of only £5.00 per family. If you haven’t renewed your membership for the current year (the renewal date is 1st January each year), it’s not too late to do it now! Here is a link to our membership form. That’s all for now however, we are always open to suggestions and would love to hear from you if you feel you have a contribution to make for the benefit of Bidston Hill. Our email address is info@bidstonhill.org.uk. We hope you will enjoy use of the Hill over the summer months and look forward to seeing you. 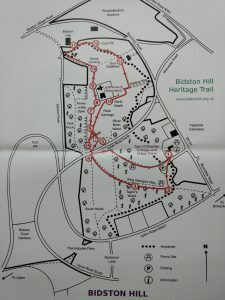 This entry was posted in News and tagged bats, Bidston Hill, Friends of Bidston Hill, heritage, Lighthouse, membership, Newsletter, Spring Clean, volunteer, Windmill. Bookmark the permalink.